The gist: You can only lead once you have trust, which is hard to gain and easy to lose. Smart leaders protect their reputation by dreaming big but only promising what they can deliver. My dad is one of the most trustworthy people I’ve had the pleasure of knowing. When he says he’ll do something, I believe it. It’s easy for him because he only makes simple promises that are within his control. There’s just one circumstance where he falters: fishing. Just like Dad, I wanted a fish. But, unlike Dad, I was an impatient kid prone to tantrums over schedule delays. When you have a big vision, it’s tempting to make big promises to persuade people to help you with it. The problem, though, is that most important things don’t happen over night.1 Belief comes from seeing promised results. Results take time. And giving up your time takes trust. 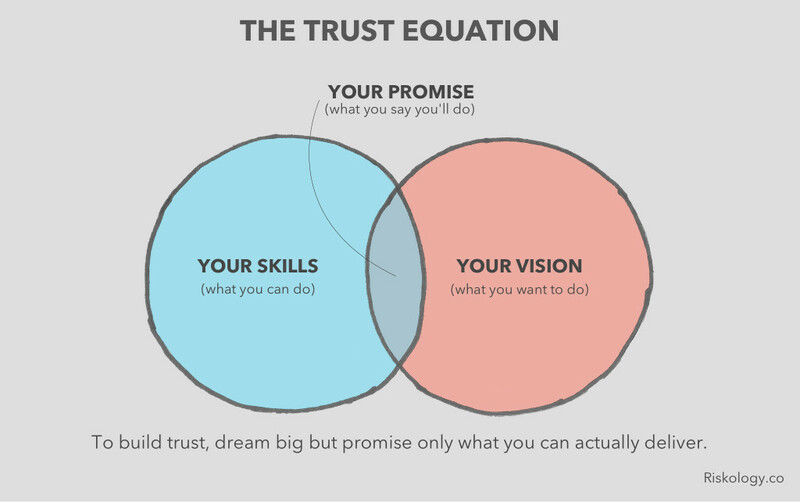 How do you build trust with people so they’ll stick with you for the long-term? Like this. Researchers put kids in a room with a marshmallow and some simple instructions: Wait 15 minutes before eating it and you can have two. It was a simple study on willpower and coping mechanisms. They wanted to see what strategies the most patient kids used to earn the big, sugary payoff. By itself, the study was unremarkable. What’s interesting is what happened 40 years later. The researchers kept tabs on the kids and measured their success across a number of life categories. The patient kids were significantly more successful than the impatient ones. So there we have it—a simple rule success backed by science: Get people to forego the marshmallow today for two marshmallows tomorrow and you’ll build a strong coalition for your goals. Not so fast. That experiment with a lesson so simple it must be true is actually quite flawed. Yes, the patient kids did turn out better. But what the researchers missed is an important variable that actually makes stuffing that marshmallow in your face right now—damn the consequences!—a perfectly rational choice. That variable is just as present in your own endeavors, and it could be keeping the people you need on your side from helping you. The marshmallow experiment, such a hallowed study, lasted decades before it was challenged by a team at the University of Rochester. Same scenario. Same marshmallows. Same kids 2. This time, though, they ran a concurrent test with one extra variable: trust. Half the kids were conditioned to trust because they were given what was promised. The other half were swindled—there was nothing better waiting for them.” Kind of mean but, you know… science. Then they ran the kids through the marshmallow experiment again. The ones who’d been conditioned to trust? Most of them waited patiently as long as they were told. The others stuffed the marshmallows down their l throats as fast as their little hands would move. Their thinking: Why hold out for more? These jerks can’t be trusted. It’s hard to overstate the importance of trust in relationship building. When you have it—and continue to prove you deserve it—people will do anything you ask them to. When you lead with integrity, you can take your community to enormous heights. But even one slip—one promise left unfulfilled—can erode that bond. They’ll second guess you, and everything you try to do gets harder. Want to create a new product? Reorganize your team? Make an impact on the world? Trust is the prerequisite. And it’s far easier to keep it than to get it back after you’ve lost it. The simple formula to keep you headed the right direction is to under-promise and over-deliver. I give my dad a hard time about fishing, but he was good at this in other ways. As long as a fish wasn’t involved, I knew I could trust Dad to do what he said because he was careful about what he promised. He’d set expectations low and work to make the outcomes high. One year, around Christmas, I told my parents I wanted a guitar. Dad was careful with his promise. He said he wanted me to have one but that they’re expensive and I shouldn’t get my hopes up. Sure enough, though, there was one under the tree that year. If I’m honest, Mom probably had something to do with that decision, but the excitement and happiness I had from getting more than I expected is something I still remember decades later. I don’t play nearly as often as I should these days, but there’s still a guitar sitting in my living room. I never lost the passion. 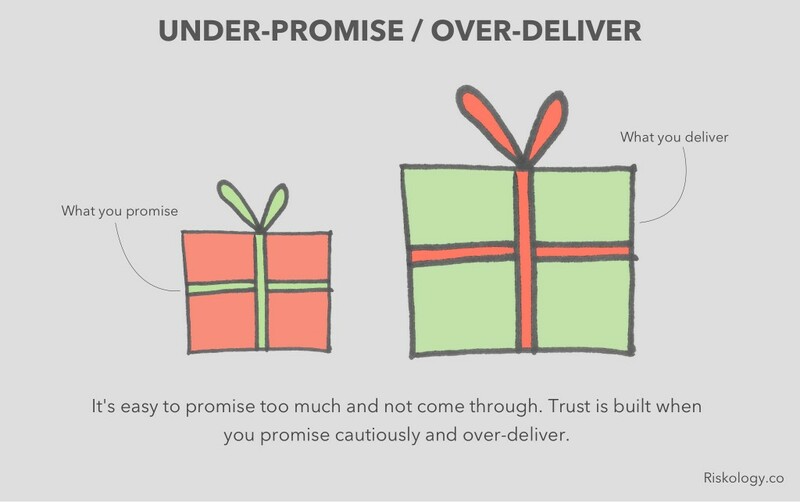 Under-promise, over-deliver. A simple concept so easily messed up. It takes nothing to talk big, but following through is hard work. If you’re building something, set modest expectations and surprise people with something great. When you’re launching something, don’t announce it until you’re sure you can meet the launch date. When you promise, promise small. No one will be mad when you outdo yourself. Why are we so mistrusting of politicians? Why does the U.S. Congress have an approval rating so low it would be held back three grade levels if it were a student? It’s because politicians promise us big, sweeping changes they can’t actually deliver. They tell us what we want to hear to get elected and hope we’ll forget once they’re in office and the real work starts. But we don’t forget, do we? We remember, and we get mad when those promises go unfulfilled. Is the answer to only make small promises? Probably not. Politicians who make tiny promises—even when they follow through—don’t get elected because we want big changes. The problem is partly our fault, right? We demand big things, so politicians promise them to us. Then we get upset when they can’t actually deliver them. It’s a dysfunctional relationship to be sure, but it’s part of the equation in trust and leadership—people want to see you doing big (difficult) things to get on board. There’s something to be learned from politicians who successfully run the gauntlet. They succeed by selling us a big vision, but only promising changes—milestones—they know they can make. Former U.S. President Obama is an example of someone who both succeeded and failed at this. I voted for him in 2008 after becoming self-employed and realizing how big a mess the American healthcare system is. He said he had a vision for overhauling it and painted a picture of what it could be. Just as important, though, is what he didn’t do. He didn’t promise exactly how it would work. He promised the actions he would take—the ones he could guarantee—to move towards that vision. That’s not the only reason I voted for Obama, though. He also promised to close Guantanamo—a not-so-secret prison in Cuba. This is a promise he couldn’t keep and, almost 8 years later, it still makes me angry. The difference between how President Obama sold his healthcare vision and his Guantanamo promise was night and day. In one case, he created a grand—but strategically vague—vision and promised only the milestones he knew he could meet. Each time we reached one, it felt like greater momentum. The lesson transcends politics. Whatever side of the aisle you fall on, the rules for building your own movement and maintaining the trust of the people who will help you build it are the same: Sell the vision, but only promise the milestones you can deliver. Think about the big mission you’re working on. If you want your team or your community to invest their limited time and effort in your vision, ask yourself what milestones they need to reach along the way. Choose the ones you can reach in the next day, week, and month and be realistic about what it will take to reach them. Remind people about the long-term vision, but focus on what you can really deliver right now. That’s how you build trust and momentum. Now, who wants to go fishing? And most fish, apparently, aren’t caught in two hours. Okay, not the exact same kids—they were 60 years older by then.